Do spring flowers and bright blue skies give you a runny nose and itching eyes? Seasonal allergies. I'm going to explore the signs and symptoms of allergic rhinitis and well as treatment options. We complain all through the bitter, cold winter, and we can't wait to get to the warm spring. But for many people, April showers bring May flowers and seasonal allergies or allergic rhinitis. Rhinitis is the inflammation of the nasal passages or upper airways. It causes symptoms such as a runny nose, stuffy nose, itchy throat, and more. Allergic rhinitis can occur at any age, but it most commonly presents in children and in young adults. You are at increased risk for allergic rhinitis if you have a family member with seasonal allergies or if you have asthma or eczema. If you have allergic rhinitis, you are not alone, because over 20 million Americans also have allergic rhinitis. The actress and singer, Scarlett Johansson, who has starred in multiple Marvel movies, including The Avengers, Iron Man 2, Captain America, well, she also suffers from seasonal allergies, and the actor, Orlando Bloom, also has allergic rhinitis. You've seen him in the Lord of the Rings and the Pirates of the Caribbean. You Might Also Like: What Is Hypertension or High Blood Pressure? 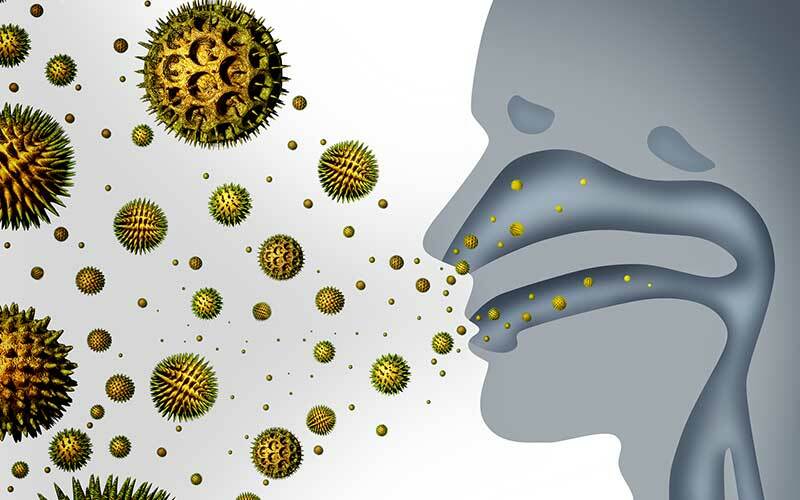 Allergic rhinitis is caused by small airborne particles that trigger the immune system. These particles are called allergens. This is what happens in your body. You walk outside. You inhale the nice spring air. As you inhale it, you notice your car, that you just got washed yesterday is now covered with that bright yellow-green pollen. As you have inhaled spring's nature, you have also inhaled some particles of pollen, a tiny airborne particle. This pollen, or an allergen, now triggers your immune system. It triggers an inflammation in your nasal passages by releasing immune cells, such as mast cells and basophils. These cells stimulate the release of histamines which cause the inflammation in your nasal passages. Once you have this inflammation, it then causes you to have nasal congestion or stuffiness. It can cause a runny nose. It can cause an itching in the back of your throat or in your ears. It can also cause postnasal drip, which is the sensation that mucus is just dripping from the back of your nose to the back of your throat. These are the signs and symptoms of allergic rhinitis. As your immune system continues to be triggered, these symptoms can spread from just your nasal passages on into your lower airways or your lungs. You can then get inflammation in your lungs which can cause shortness of breath or wheezing. You can also get signs and symptoms of allergic rhinitis in your eyes from your immune system. Red eyes, itching eyes, running eyes. All of these things happen with allergic rhinitis which is triggered by allergens. What are some other allergens that trigger allergic rhinitis? We mentioned pollen, but also there's ragweed, mold, grass, trees, dust mites, pet dander or the hair from those lovable, adorable pets of yours, like cats and dogs. Also, beautiful spring flowers can be allergens that trigger allergic rhinitis. You can imagine that a beautiful green golf course has many of the allergens I just mentioned, which is why it's quite interesting that Tiger Woods has been reported to have seasonal allergies. Allergic rhinitis can usually be diagnosed with a good history and physical from your physician, but if you are a person who has difficult to treat symptoms, you may require certain blood, allergy, or skin testing. How do you treat allergic rhinitis? Well, since allergic rhinitis is caused by allergens which trigger your immune system, the best treatment is simply to avoid the allergens. However, if you're a person who is allergic to flowers, pollen, grass, trees, avoiding the entire earth might be a bit challenging. Let's talk about other treatment options. One treatment is nasal saline, just salt water in the nose. It's simple but effective. You can purchase nasal saline over the counter and you just drain or flush your nostrils with the salt water. You take the nozzle and you irrigate each nostril. You irrigate the nasal passage over and over again. This helps to wash away those allergens, those small particles that are stuck in your nasal passage. You can also try nasal steroids, such as Flonase. The nasal steroids help to decrease the inflammation in your airways. In order to use the nasal steroids, it's important that you do it correctly. Take the nozzle, put it up your nose, and you aim it away from your nasal septum. You actually aim it toward the outside corner of your eye, but of course, the nozzle is inside your nostril. You do this to each nostril and this helps you to absorb the medicine. Make sure that you clean your nostrils first with the nasal saline before applying the nasal steroids. Other treatments include antihistamines. There are the sedating antihistamines that make you sleepy, like diphenhydramine or Benadryl, and then there are the nonsedating antihistamines, like Allegra, Claritin or Zyrtec. Other treatments include decongestants, and if you have more difficult to control symptoms, you may need to further consult your physician for allergy shots or immunotherapy pills. That's an overview of the signs and symptoms of allergic rhinitis or seasonal allergies. As usual, I want you to prioritize yourselves. If you have seasonal allergies, make sure you seek your doctor's consultation and find out which treatment is best for you. Also, I want you to continue to prioritize yourself, go to your doctors, and please live your happiest, healthiest life. Do you have any questions about signs and symptoms of allergic rhinitis or seasonal allergies? Leave a comment below. You got my attention when you said that it’s possible that you’re suffering from allergic rhinitis if you’re experiencing itching in the back of your throat or in your ears. My son has been scratching his ears since yesterday. Additionally, his cough does not go away no matter what I do. I will make sure to bring him to an allergy clinic to be treated properly. Thanks!